On the contrary than Raphael, our artist from our last posy who, at the age of 18 was entitled as “master” of the arts, the German Emil Nolde decides that he is going to paint at the age of 31. Nolde joins the artistic group called Die Brücke (in German, “the bridge”) who were, basically, very similar to the fauves in France. Let us remember that the latter, as we talked in the post The piano lesson by Matisse, were characterized by the use of vivid colors, the simplification of forms and the suppression of unnecessary details. The figures were then reduced to their basic structure, which means that, for example, you can see a person; but you won’t probably distinguish it from others. The artist, who seemed to have a bad temper, argues with several members of Die Brücke. Short after, they decided to kick him out of the group and he is obliged to continue his career by himself. Although in this new period he is still committed to the principles of Die Brücke, like the use of color and the simplicity of shapes, there is something he does differently: Nolde’s work is rawer and more emotional; and, his brushstrokes are more violent. That is why the artist is generally considered as an expressionist and not so much as the more-controlled fauvists. If we talk about primitivism of the shapes, Still life with dancers is as primitivist as it can be. If this was the intention of the artist, from this blog, we applaud him. 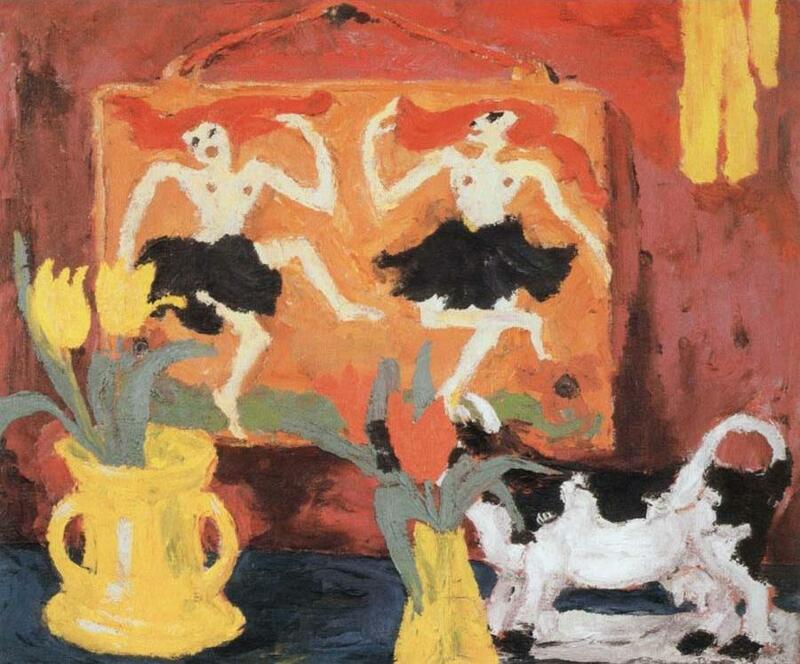 In it, we see a table with 2 yellow vases with tulips, a cow-shaped piece of pottery and, at the background, a canvas with two almost naked women dancing while they touch their hair. The brushstrokes are thick and, the overall composition, seems messy. Although I generally support the real emotion of the artist to be put in a canvas, this painting seems to transcend the grotesque, almost reaching a something tacky. The tulips are completely bidimensional and flat; at the same time that the cow has curvy thick brushstrokes. This makes the composition confuse and strange. And I don’t get to see anything I like. ~ by Álvaro Mazzino on November 23, 2010. If you want to try your luck, you’re better off asking a regional arm of Samsung like Samsung UK or Samsung France for information. Regional arms often cough up information but that information is sometimes way off. While Abloh’s footwear was obscured by his trousers to some extent, it’s clear that the Jordan 1s on-feet here are the same ones that have been leaking recently. This entry was posted on November 23, 2010 at 09:50 and is filed under Expresionism.You can follow any responses to this entry through the RSS 2.0 feed.You can leave a response, or trackback from your own site.